There are four main different ways to make pickles. They all involve the pickles eventually being saturated with adics, salt or both to enable preservation and flavor characteristics. Salt and acids are the primary components that inhibit pathogenic microbes in many fermented foods so you’ll notice that theme often as you increase your understanding of it. The quick pickle or vinegar pickle method involves the vegetables sometimes first being lightly cooked to soften them slightly. Then they’re packed into jars in a mixture of white vinegar, water, salt and spices. Vinegar pickles are heated while being canned in a water bath canner which sterilizes them, softens them further and allows the acid and spices to infuse into them. In this case, the cucumbers have a bright, clean acidic taste with minimal complexity. 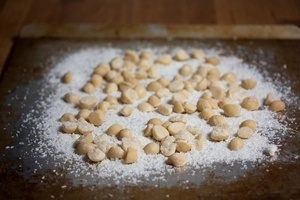 The salt brine method involves the vegetables being soaked in a stronger salt brine from a few hours to an entire day. The vegetables are then packed into jars with a mixture of white vinegar, water, sugar, salt and spices then canned in a water bath canner. These pickles have a clean, sweet, acidic taste. Bread and butter pickles are a good example of pickles made from the salt brine pickling method. Pickles that are vinegar brined endure repeated soakings in a vinegar and sometimes salt and sugar solution. Sweet gherkins are an example of the vinegar brine pickling method. Another popular way to make pickles is the wild fermented pickling method. This method, which is similar to how sauerkraut and kimchi is made, involves placing the cucumbers in a salt brine with spices for up to several weeks. 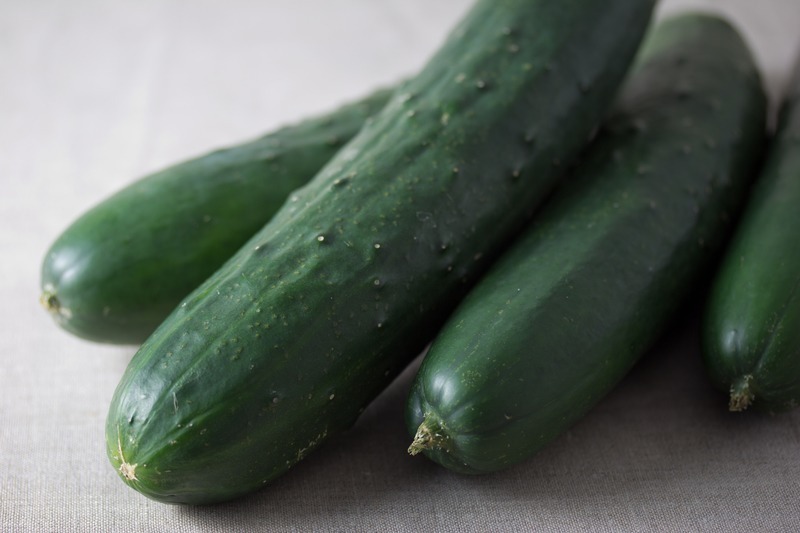 The salt inhibits pathogenic microbes from being able to get a foothold as multiple generations of friendly microbes leave their imprint by making their acid and flavor contributions to the cucumbers. The result are pickles that can be described as being considerably more funky and complex. Being a fermentation fanatic, I obviously hold wild fermented pickles in high regard. 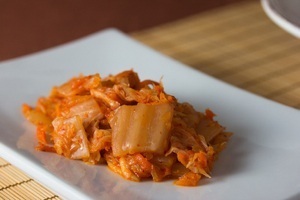 Fermented foods is an example of something rare in the food world where you get the best of both worlds: superior flavor in a food that is considerably healthy. The health aspects of fermented foods are becoming increasingly well known by modern science and thanks to books like The Art of Fermentation. Health benefits of wild fermented foods include improved immune system response, protecting the stomach from pathogenic microbes, normalizing the digestive system, increasing nutrient absorption and enabling the digestive system to more rapidly remove toxins from food. Since eating at least three fermented foods per day such as yogurt, kimchi and miso, I haven’t gotten a cold in almost three years. I used to get a cold almost every six months. I also have considerably less stomach issues since eating a wide variety of fermented foods on a regular basis. This could this be a coincidence? Who knows, but one thing for sure is that I sure do love the taste! When I run out of pickles or kimchi I actually start to panic. Since we’re literally curating a specific band of ragtag microbes to ferment our cucumbers right off the cucumbers themselves, it’s important to use clean, organic cucumbers that have been rinsed with water but not sterilized. Cucumbers grown with pesticides may work, but depending on what type of pesticides used and how much, it’s impossible to tell how things will pan out for sure. I can’t stress enough the importance of finding firm cucumbers. If they’re soft in any way, that means that enzymes have already gotten to work breaking down the pectin and there’s no way to reverse this process. The microbes that ferment pickles, sauerkraut, kimchi and other vegetables are known as lactic acid bacteria, often abbreviated in the science world as LAB. These bacteria rapidly convert naturally occurring sugars such as glucose and fructose into lactic acid, acetic acid and sometimes other compounds depending on the particular bacteria present. Lactic acid bacteria take over by the help salt being present in the brine. Salt dehydrates the pathogenic microbes so they can't function. This allows the lactic acid bacteria to make a run for it and produce as much lactic acid as they can. Before fermentation, lactic acid bacteria are far outnumbered by other unruly microbes. Think David and Goliath, microbe edition. During fermentation, the acids produced by the lactic acid bacteria rapidly increase which lowers the PH, overwhelms all other microbes and allows the multiple generations of the lactic acid bacteria to make their flavorful mark on the vegetables. Once your vegetables are saturated with ample amounts of salt and acid, the pathenogenic microbes are wiped out and the result is vegetables that are remarkably well preserved. No wonder Captain Cook sailed the world with barrels of sauerkraut on his ship! Vegetables soften because pectinolytic and cellulolytic enzymes are secreted by naturally occurring microbes that originally outnumber the lactic acid bacteria. Cellulose and pectin form the hard structure of plant material. They’re responsible for the crunch of a piece of cabbage or cucumber when you bite into it. Over time, pectinolytic and cellulolytic enzymes work to break down Cellulose and pectin to make the vegetable soft which is not desired in fermented vegetables. Once the PH drops to about 5 or lower, these enzymes are deactivated which is why, even though your vegetables have been fermented, they will still have a crisp and crunchy texture. It’s important to note that if your fermentation doesn’t start off fast enough, these enzymes can begin to soften your pickles before being deactivated by the acids which will reduce the crunchiness of your pickles. 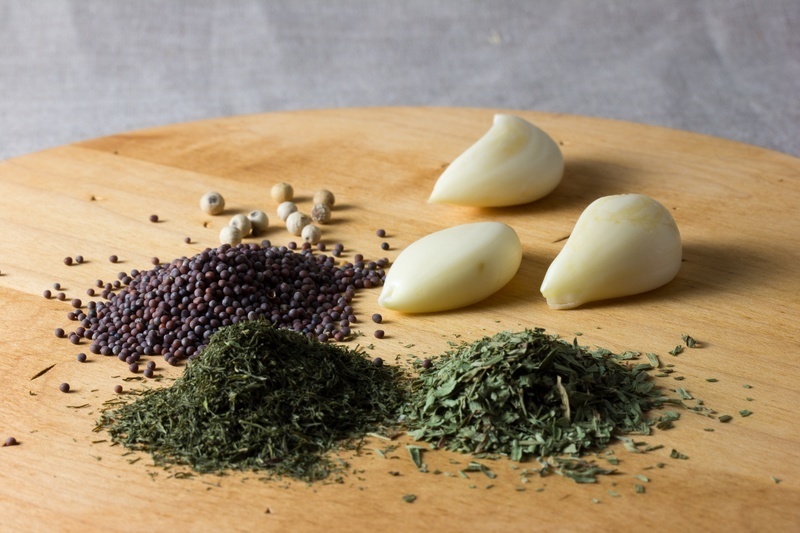 Plants containing tannins, in the form of grape leaves or green tea are often added to pickle brine as a form of crispness insurance to make sure these enzymes get deactivated as quickly as possible. Multiple generations of lactic acid bacteria make their mark on your wild fermented food. It’s important to ferment between 64F to 72F (18 to 22C) to give all of the bacteria a chance thrive enough to produce the best possible flavors. Below is a list of the main bacteria responsible for wild pickle fermenting. The first bacteria to work on vegetable fermentation are usually Klebsiella and Eenterobacter which work to acidify the environment and set the stage for Leuconostoc mesenteroides. Leuconostoc mesenteroides produces a larger amount of lactic acid and is a heterofermenter, which means it produces multiple compounds such as lactic acid, acetic acid, ethyl alcohol, C02 and mannitol. Heterofermenters such as Leuconostoc produce about 50 percent lactic acid, 25 percent acetic acid and ethyl alcohol and 25 percent carbon dioxide. These compounds are all important flavor contributors to high quality fermented foods. Leuconostoc grows more rapidly than the other lactic acid bacteria. The moderate acids and C02 it produces work to inhibit undesirable microbes in two ways: The C02 replaces air and creates an anaerobic (oxygen-free) environment and the increased acid drops the PH. This environment can actually stimulate the growth of some of the lactic acid bacteria further. Temperatures above 72F (22C) supposedly inhibit Leuconostoc mesenteroides from growing. Since this bacteria is essential for optimum flavor of fermented vegetables, it’s important to not ferment at temperatures higher than this. Once the acidity increases to a specific level, Lactobacillus plantarum takes over. It’s a homofermenter which means it only produces one type of compound: lactic acid. This is the workhorse bacteria that produces the most lactic acid by eating sugars and even the mannitol that was produced by Leuconostoc mesenteroides. It’s also the fermentation generation that works the longest. Lactobacillus plantarum is responsible primarily for fermenting and producing most of the lactic acid in pickles, sauerkraut, kimchi, cheese and even fermented meats like charcuterie and salumi. Now the finishing bacteria take the stage. Lactobacillus brevis is a heterofermenter, producing mainly lactic acid, acetic acid and ethanol but in smaller amounts than previous bacteria generations. Pediococcus cerevisiae is a homofermenter, producing only lactic acid. One of the important things about wild fermenting is understanding how much salt you’re going to need in your brine. Salt is essential for discouraging pathogenic microbes so the lactic acid bacteria can function uninhibited. Salt is also important for improving flavor but if you have too much of it your fermented food will be too salty and the growth of your lactic acid bacteria will be inhibited. The trick is to use just as much salt as you need but no more. In fermented foods, that’s about a 2 to 5 percent salt concentration, depending on what you’re fermenting. Most vegetables taste best after fermented in the neighborhood of 2 to 4 percent salt. How do you calculate the percentage of salt in a solution? After you learn how, you’ll have one more reason to realize why the metric system rules. In 100 mL of water, adding 1 gram of salt brings the solution to 1 percent salt concentration. So 3 grams in 100 mL of water equals a 3 percent salt solution. Since you’re likely going to be fermenting with more liquid, scale this measurement up to 1 Liter which is ten times as much as 100 mL. 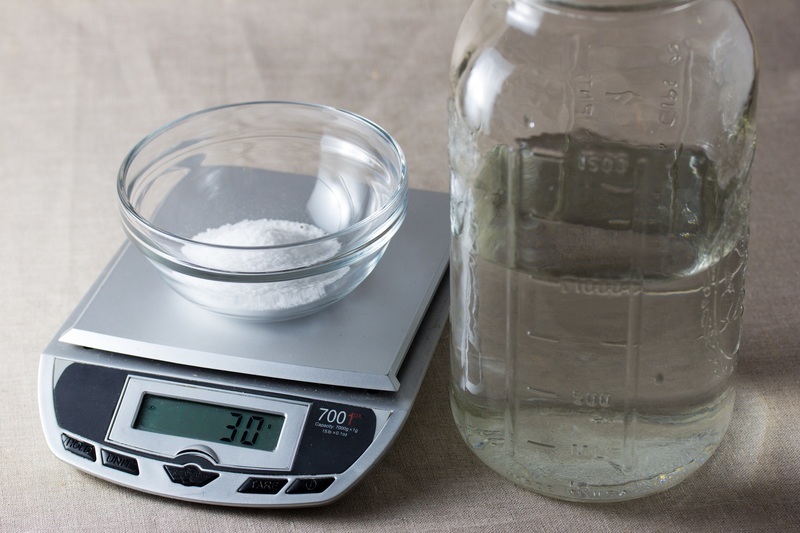 In this case, 30 grams of salt in 1 Liter equals a 3 percent salt solution which is a perfect salt solution to have for pickling things like cucumbers, carrots, asparagus and other vegetables that are to ferment in a brine. Once you have your half gallon Ball jar that is already marked at the 1 Liter level, all you have to do is make sure you have a gram scale, also known as a jeweler’s scale, or as I like to jokingly refer to as, a drug scale. In my experience, a 3 percent salt solution is perfect because it's strong enough to inhibit pathogenic microbes and bring on savory flavors but subtle to the point of where you don’t feel like you’re gulping down seawater. This recipe calls for two grape leaves or a bag of green tea. This is to infuse tannins into the solution that will inhibit pectin breakdown which will help your pickles be as crunchy as possible. Feel free to mix and match the spices to your liking. The types and amounts of spices rarely affect the vitality of the fermentation process. 2 grape leaves or 1 tea bag of good quality green tea (not Lipton). 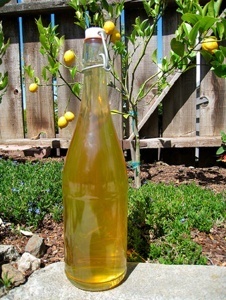 Add water to the 1000 mL level on a half gallon Ball jar. If you don’t have a Ball jar, just be sure to measure out 1 Liter of water. Add the salt, garlic, grape leaves or green tea, dill, tarragon, yellow mustard seeds and peppercorns. 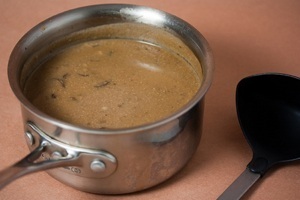 Secure the lid and shake until the salt is dissolved. Wash the cucumbers, slice off the ends and discard them. If you’re making whole pickles, place them into the brine. if you’re slicing them, proceed with this step. 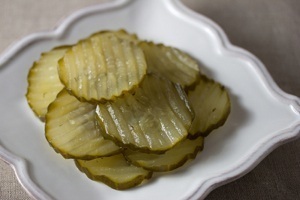 Using a mandoline is your best bet if you prefer that famous crinkle cut on your pickles. The crinkle cut isn’t just for aesthetics; it actually helps anchor the pickle in your sandwich or burger to keep it from sliding out and landing on your plate. It’s essential to cut the pickles into 1 inch sections so they can easily and safely fit into the slider attachment in your mandoline for slicing. Originally I was slicing the pickles without the attachment because I was too lazy to cut it into sections. “Oh I’m totally not going to slice the tips of my fingers off”, I thought. I then realized how it would be just too easy to get carried away and just keep slicing until I sliced my fingers in mere seconds. Luckily, I realized that using the slicing attachment is really the only way you can guarantee that you won’t cut yourself. Thinking to yourself that you’ll be smart enough to stop slicing at the proper time won’t work. Don’t do it! it’s not worth it! The downside of using a mandoline is that it’s more cumbersome and some of your slices may have to be discarded because they’ll end up as partial slices. The unused partial slices work great in salads though. You can also save them and ferment them in your sauerkraut. And they thought they were getting away. Another option is to slice the cucumbers by hand. In this case, slice them 3 mm (1/8 inch) thick. 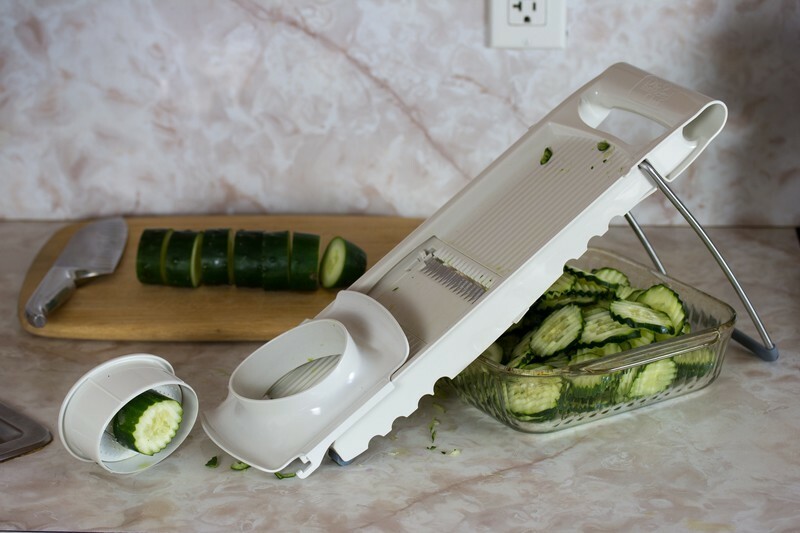 By far the easiest way to slice your cucumbers is with a food processor slicing attachment if you have one. In this case, fit it with the 3 mm (1/8 inch) or similar slicing disk, feed a cucumber into the feed tube and let ‘er rip. Add the cucumbers to the jar. As they fill to the top, push them down so you can pack them in but not so much so they start to get crushed. Secure the lid to the jar and give it one last shake to incorporate the ingredients. Replace the lid with an airlock lid if you have one, or leave the lid secured and “burp” the jar of C02 by loosening and tightening the lid daily. Ferment preferably between 64F to 72F for 1 to 3 weeks, until the desired sourness is achieved. You want to make sure your pickles are fully submerged in the brine at all times. 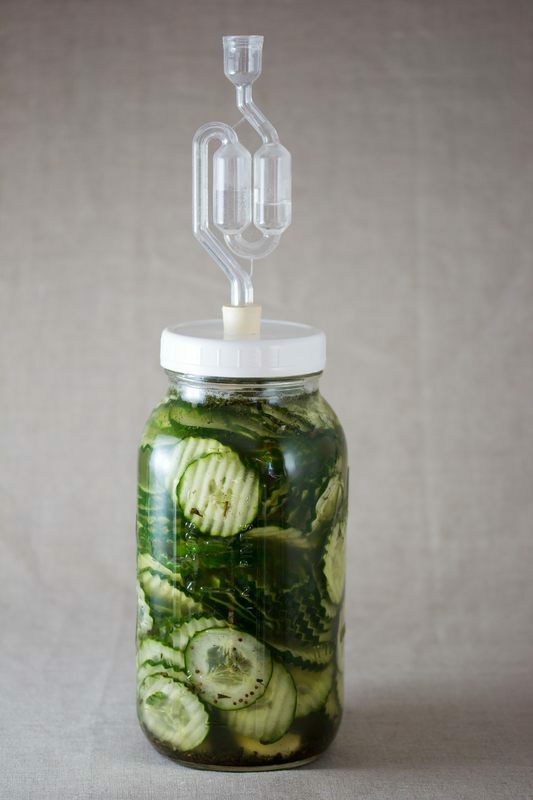 As your pickles are fermenting, rising C02 may push some of them up and out of the brine. If this happens, give the bottle a shake to push them back down, or if it really starts to become an issue, just discard the top layer of pickles if you’re fermenting sliced pickles and put them in salads, sauerkraut or relish. Feel free to pop the airlock off and have a taste but try not to remove it any more than a few times during fermentation. 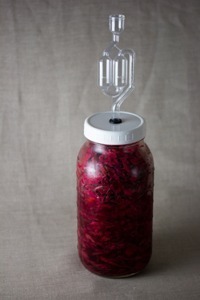 The airlock inhibits the ability of bacteria such as acetobacter and oxygen from reaching your fermented food. The more you remove your airlock, the more these guys will get in and start sliming the surface of your brine. If this happens, just discard the slimy layer and any pickle slices that it’s growing on and move on with your life. If any slime, known in the science world as biofilm, has gotten on any whole pickles, just remove the pickles from the jar, rinse them off with water and return them to the jar. Find out how to make your own airlock for your Ball jars. If you’re unable to locate an area of your house below 72F (22C), you might want to reconsider wild fermenting. These temperatures favor other microbes that can metabolize the pectin and produce extra funky flavors in your pickles. The optimal temperature is 64F to 72F (18 to 22C), where fermentation can take up to several weeks. If you must ferment at higher temperatures, it’s not the end of the world. Feel free to ferment as high as 85F (29C) but just keep in mind your pickles will be finished in considerably less time. As a general basis in the fermentation world, lower temperatures for longer periods generally produce better flavors and a more shelf stable product. 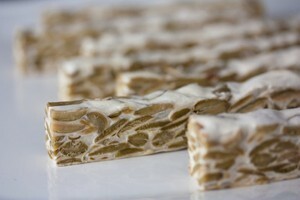 It’s all about keeping the microbes at their most comfortable temperature so they’re happily producing yummy flavors. Once your pickles have soured to your liking, replace your airlock with a jar lid and place the container in the refrigerator to slow down fermentation. There’s no need to transfer the pickles to another container; you already have them in an awesome jar! The word refrigerator is just a funny name for fermentation slowing device so keep this in mind as your pickles continue to ferment extremely slowly and acid increases ever so slightly as they’re kept in the fridge for extremely long periods. Your brine is gold. Reuse it! As you use the pickles, you’ll be left with an amazing brine which can be used for soups, stews, deglazing, a probiotic health tonic and of course, picklebacks! This brine should last as long as your pickles if it’s stored the same way. Since your pickles are already inhabited by beneficial microbes, submerged in brine and stored in an airtight container, they’ll last exceptionally long in the refrigerator. I never seem to be able to make mine last for more than 6 months without eating all of them. If properly acidified, they should theoretically keep in your refrigerator for around 1 year. Makes about ½ gallon sliced or about 4 medium sized Wild Fermented Pickles. I have owned some airlocks for awhile and by now have forgotten exactly what inspired me to get them. Thank you so much for reminding me! When I try this out I will let you know exactly how it goes. I appreciate your relevant topics on fermentation and vegan food. I'm stuck on your blog and should be working on other things but have had so much pleasure looking at your recipes and ideas and dreaming. Thank you again! So glad to inspire you to waste time on creating more vegan food VeganRN! ;) Once you understand the science, fermenting vegetables is actually one of the least time intensive activities in the kitchen because the microbes are doing all the work for us. Now THATS something I can get behind. Good luck!